Clayo Laanemets understands first-hand why serious mental illnesses — including schizophrenia spectrum disorder, affective psychosis and borderline personality disorder — are among the leading causes of disability worldwide. She’s determined to improve the health and quality of life for people living with these mental health disorders and their families. “As the primary caregiver to a family member with schizophrenia, I’ve experienced the volatile nature of Canada’s mental health-care system and the poor linkages between hospital and community supports,” said Laanemets who graduated from DLSPH in November 2017 with an MPH in Health Promotion. 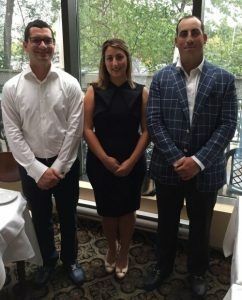 That’s why she applied for the Healthy Generation Fund, a social innovation competition supported by Ashley Clerici and her husband Yianni Soumalias, and Ashley’s brother Adam Clerici whose family founded Closing the Gap, a health-care company committed to homecare and other personal support services. 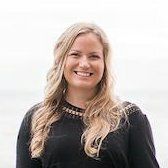 After receiving funding last fall, Laanemets is now Project Innovator at the Centre for Global eHealth Innovation where she leads a team of young people who are developing ConnectingMINDS, Canada’s first online peer navigation platform for young people experiencing serious mental illnesses and their caregivers. 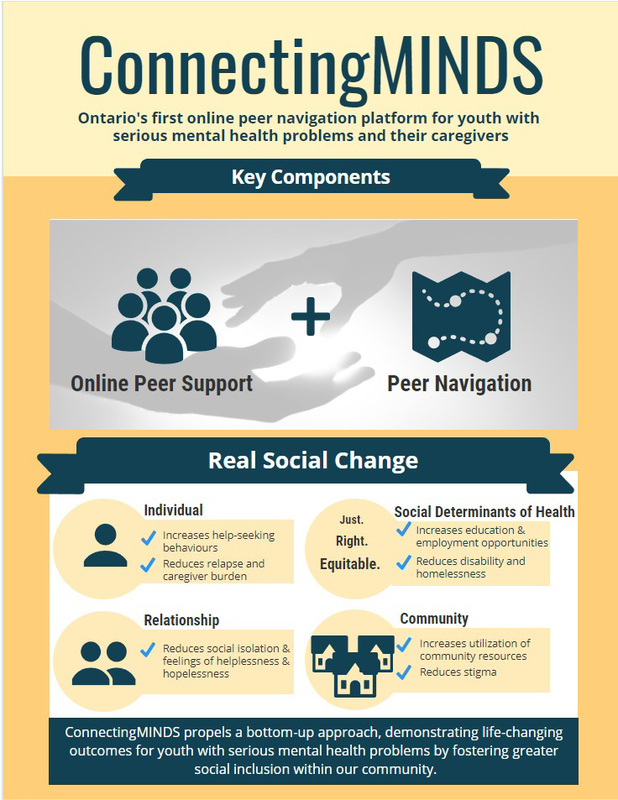 ConnectingMINDS will connect young people with serious mental illnesses as well as their caregivers with others who have gone through similar circumstances and help navigate mental health resources within the GTA. Laanemets says the goal is to prevent hospitalization and relapse as well as caregiver burden by providing timely and relevant support. “By improving help-seeking behaviors, ConnectingMINDS can tackle the social determinants of health that plague this population, such as disability, unemployment, lack of education and homelessness, by fostering greater social inclusion among this highly stigmatized population,” said Laanemets. Her project co-lead, Dr. Jackie Bender, is helping Laanemets leverage the latest technology to provide resource sharing, networking and self-management support. “Peer support is incredibly helpful in boosting coping efforts and reducing isolation, not to mention its positive effects on physical and emotional well-being,” said Bender, an Assistant Professor of Social and Behavioural Health Sciences at DLSPH, and Research Scientist in the Electronic Living Laboratory for Interdisciplinary Cancer Survivorship Research (ELLICSR), in the Department of Supportive Care at the Princess Margaret Cancer Centre. Laanemets is also working closely with the Schizophrenia Society of Ontario and their Youth Advisory Committee, a diverse group of young individuals working to improve the physical and psychological health of those impacted by serious mental illnesses. 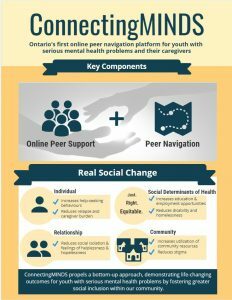 “Teaming up with the Youth Advisory Committee is critical in the design of this platform as each member has had experience in aiding family members and friends in accessing mental health services,” said Manish Dama, Board Member of the Schizophrenia Society of Ontario, Chair of the Youth Advisory Committee, and DLSPH alumnus. In addition to community youth group partnerships, Laanemets is also working with Dr. Kate Sellen, Associate Professor at OCAD U Art and Design School and Director of Master’s Program in Design for Health, to help lead the design component of this project along with a few of her students, including Sonia Tagari, a graduate candidate for the Master’s of Design in Design. Dr. Brian Rush, Scientist Emeritus at the Centre for Addiction and Mental Health who is a mental health and addiction systems expert, is also on the project team. “I feel incredibly fortunate to be working alongside such passionate and talented individuals in order to make transformational changes to our mental health and addiction system,” said Laanemets. The Healthy Generation Fund is an annual competition calling for innovative ideas in health care that is co-led by the Institute of Health Policy, Management and Evaluation and the Institute for Global Health Equity and Innovation, both based at the DLSPH. Laanemets and her fellow Healthy Generation Fund recipients will be recognized at an awards ceremony in March 2018.